You can have Athens . . . I'll take Corinth. 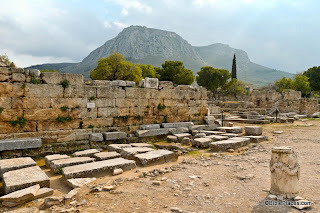 As I prepared to write another post on a site in Greece, I was drawn once again to Corinth. It is such a fascinating site in so many different ways: archaeologically, geographically, and biblically. After searching around for another site to write about (for the sake of variety) I'm throwing in the towel . . . Our picture of the week comes from Volume 11 of the Pictorial Library of Bible Lands and focuses once again on Corinth. The picture below is entitled "Corinth bema and Acrocorinth." The Acrocorinth is the tall mountain that rises in the distance. The bema (also called the "tribunal" or "judicial bench") is the structure in the left half of the picture. It was a platform on which a judge would sit as the people brought their cases before him while standing in the plaza below. This is one of those rare places where we can say that a certain biblical event took place. This place of judgment is mentioned in Acts 18, when Paul was brought before Gallio. The Roman tribunal where Paul was dragged before Gallio has been uncovered in the center of the agora. This was the bema, where Roman officials would appear before the public.... Had Paul’s trial been more formal, it likely would have been held at the North Basilica instead of the Bema. In Christian times, a church was built atop the bema. Sir William Ramsay regarded Gallio's ruling as 'the crowning fact in determining Paul's line of conduct', because it provided a precedent for other magistrates, and thus guaranteed Paul's freedom to prosecute his apostolic mission with the assurance of the benevolent neutrality of the imperial authorities for several years to come. One thing at least is certain: if Gallio had given an adverse verdict against Paul, it would have been pleaded as a precedent by Paul's opponents for the rest of his life; and a precedent established by so exalted and influential a magistrate as Gallio—a much more important personage than the politarchs of Thessalonica—would have carried great weight. The mere fact that Gallio refused to take up the case against Paul may reasonably be held to have facilitated the spread of Christianity during the last years of Claudius and the earlier years of his successor. Thus, this site can not only be tied to a biblical event, but it can be tied to a biblical event that is more significant than can be observed at first glance. The event that happened in this humble location helped determine how the rest of New Testament history played out. This photo and over 800 others are available in Volume 11 of the Pictorial Library of Bible Lands and is available here for $34 (with free shipping). 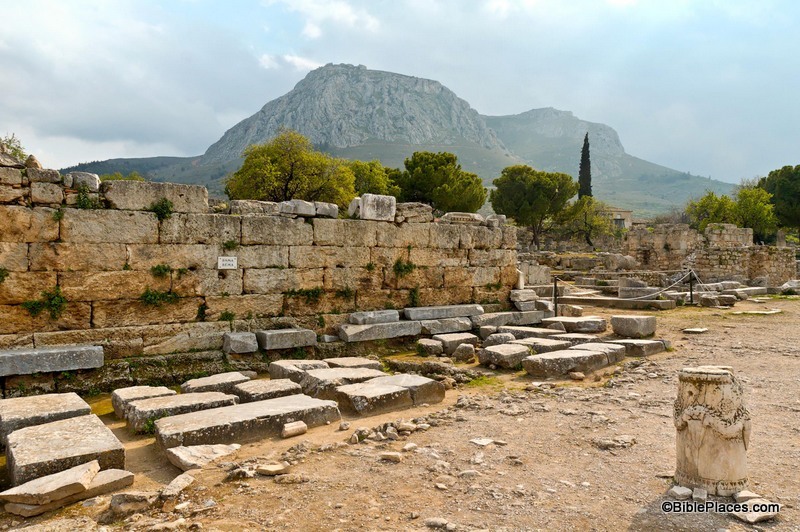 Other photos of Corinth and its surrounding territory can be found on the BiblePlaces website here and here. The excerpt was taken from F. F. Bruce, New Testament History (Garden City, NY: Anchor Books, Doubleday & Company, 1969), p. 317, and is available for purchase here. You well observed: "This is one of those rare places where we can say that a certain biblical event took place." And so, can I encourage you, or one/some of the contributors to BiblePlaces.com, to author a post (or series of posts) regarding specifically "places where we can say that a certain biblical event took place?" I think such a post (or series) would be of great interest to many. If such has already been done, could you steer me to such? Thank you. While the Corinth bema represents an important judicial event from the NT, the most important judicial event from the OT, namely the global Flood of Genesis, can be seen just about everywhere. Aside from about 80% of the planet that is still covered by water (or ice), some of the best places to see it are on modern roadways that cut through mountains, thereby exposing rock layers. Many of the animals killed during the Flood are on display (as fossils) in museums around the world. Another great way to see this Biblical event is when you fly over land, particularly the USA's southwestern desert, & see remnants of water erosion ... VAST amounts of it! It's a great reminder that we need to be (spiritually) in Christ the way Noah & his family were in the ark before God finally says, "Time's up!" Thanks for the suggestion. Maybe someone can do a series entitled "This Exact Spot." We might include the Areopagus, the Capernaum synagogue, the southern steps of the Temple Mount, a narrow portion of the route to Shechem, the Wadi Fara, the high place of Dan, and the location of Jehu's chariot ride. The more specific you want to be, the more difficult it is. Can we also include the Pools of Bethesda and the Pool of Siloam even though we don't know the precise location (and such may actually still be buried)? I can't make any promises on writing such a series; all of us contributors seem to be perpetually over-committed.